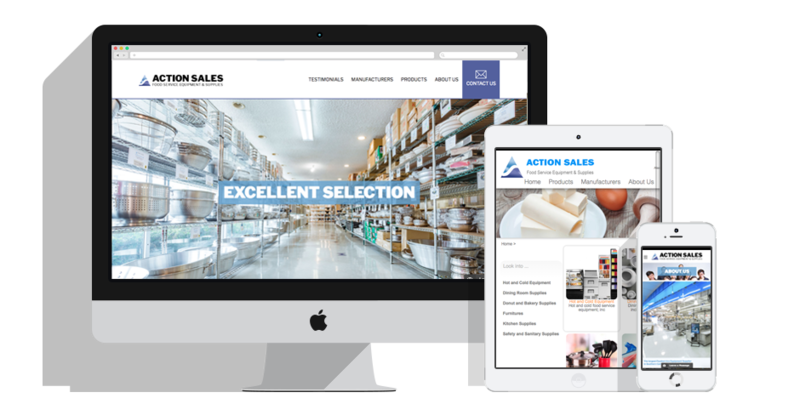 With over forty years of experience, Action Sales is the largest foodservice equipment supplier in Southern California. While they did have an existing site, they came to Ready Artwork wanting a new and better website. The client wanted this new website to heavily reflect their experience and reliability. The main purpose of this redesign was to focus on their branding. They had previously worked with a lot of well established brands, so they wanted to make sure that potential customers knew what Action Sales has done in the past and what they were capable of. Since the client wanted to focus on their expertise, our designers were deliberate about what they wanted visitors to the website to see first. Our designers wanted to focus heavily on designing about the testimonials and about us page. On the home page, right below the sliding banner, viewers can see a carousel of well known valued customers like Panda Express and Universal Studios. Viewers will see a section of the testimonial and can read more on the actual testimonial page. This aids in making the brand qualified and reliable. Our designers and developers also created a custom About Us page that was laid out to display the information clearly and also attractively. Other features our team integrated were parallax, to provide more dynamic interaction, a video loop on the homepage, and live chat function. The entire website feels very professional and is easy to navigate. Is it time for your website to be redesigned? Contact our team of experienced designers and programmers to see how we can revamp your brand!